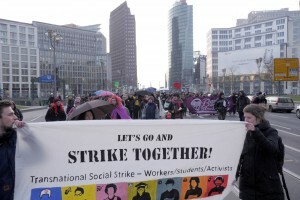 Depending on local conditions, the 1st of March 2016 is a day of decentralized and coordinated actions and strikes, aimed at disrupting regular production and reproduction, producing communication among different working conditions, making visible hidden situations of exploitation, targeting the border regime and the institutions that govern mobility and precarity. Be the 1st of March 2016 the day when we take a clear stance against a government of mobility that produces precarity for all. A day when we find common demands and claims.